The Alesis VI 25 is a nice controller with plenty of knobs and a 16 velocity sensitive pads. 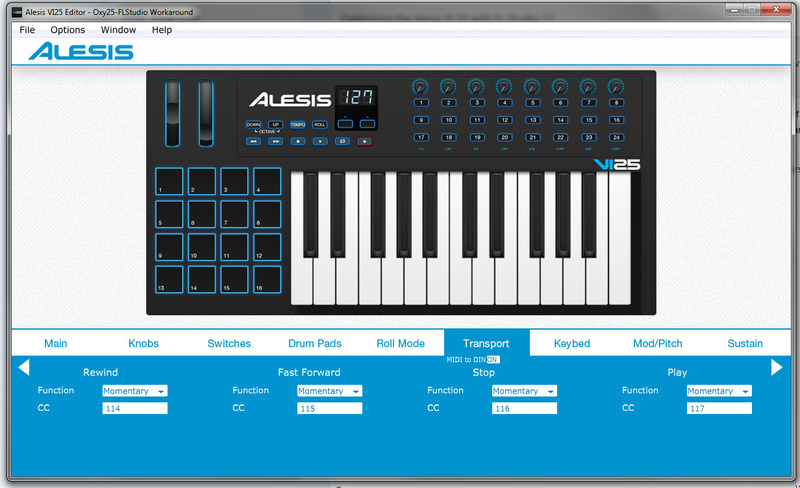 Getting it to work out of the box with FL Studio is easy enough, but getting the transport controls to work takes some editing in the Alesis VI25 Editor and manipulation in the MIDI Settings in FL Studio. Here is a quick video to show you how to set it up. Make sure you use a powered USB hub or a direct USB connection to your computer, or else you may recieve an error message that will prevent the preset from being loaded on to the hardware. In FL Studio you need to go to “Options” -> “MIDI” and then select “VI25” and then under Input find VI25 and switch from “generic controller” to “M-Audio Oxygen 25” and make sure enable is green lighted. The transport controls should be working. In order to limit the frustrations of the sometimes baffling playlist recording in FL Studio 12, there are some techniques to keep your recordings organized to a degree. The techniques vary based on whether you are recording Audio, Automation, or Score (MIDI Notes). 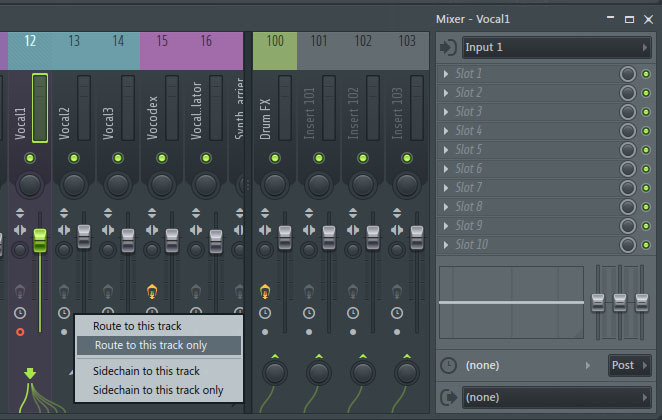 The playlist audio recording in FL Studio has been, and still remains, an odd experience where the audio file shows up in the topmost playlist lane that is empty for the length of the recording (note: that the audio recording will only be as long as the selected playlist area length, and if you continue to record in a loop it will create numerous recordings that could contain a bit of a hiccup at the beginning of the loop). Those are the known issues, so we must create a recording environment on the playlist that accounts for those nuances. The first thing is to create at least a couple of empty playlist lanes at the top – you can name or color code them if you like. If you are starting from scratch and want to create a template, these lanes should already be empty; however, if you are working with a project with sequencing already in it, or a template with empty patterns already plotted out, you will want to right click on the Playlist Track indicator (the leftmost column) on the topmost track, and select “Insert One” (do this as many times as you want for the number of audio recording tracks you think you’ll need). Next you’ll need to make sure that you have the mixer channel(s) that you want to record the audio for set up properly for recording. I would suggest recording vocals dry (with no effects in the mixer channel). 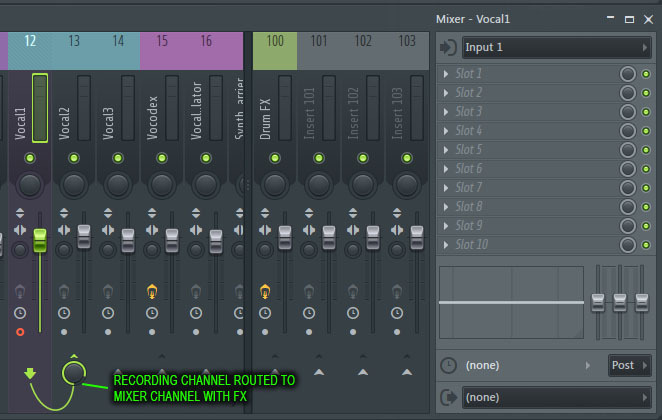 You can route the mixer channel output to effects in a different mixer channel if you want to hear the effects while recording, but want the audio recording dry. 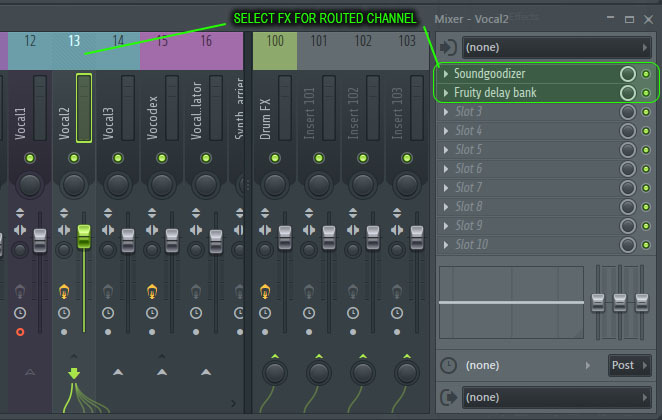 In the mixer channel that you want to route to, right click and select “Route to this track only”. A wire will show that the channel for recording is routed to the FX channel (below Channel 12 is the recording channel and Channel 13 is the FX channel that it is routed to). Select your desired FX (e.g., choose FX for Channel 13). This allows you to keep the dry vocals and apply whatever effects you wish to the recording or while you are recording. 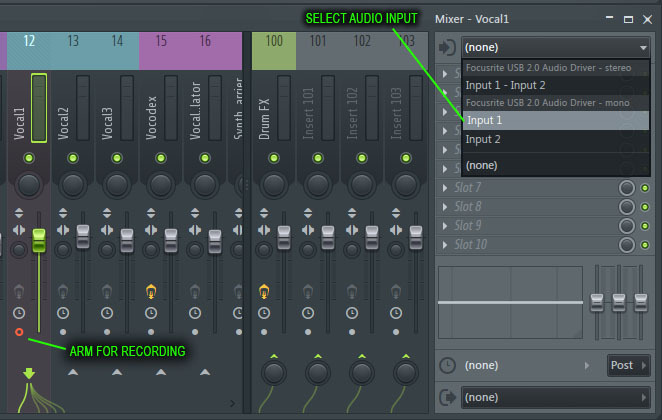 Make sure that you have the recording of “Audio” active in the transport panel. This should get you where you need to be to start recording audio from an external source. One important thing to note: the 1st bar in some recording environments may have a hiccup or have a bit of time before it actually starts recording. If you notice that this is the case – there are a couple of solutions. One that Image Line suggests is to put a bar before where you want to record. While this may be an effective solution – it doesn’t work so well when you want to keep the groove and record in a loop. So if you experience this don’t record audio in a loop that will have that delay at the start each time – repeat the section you would loop record in for a couple of minutes and just put a lead in bar at the beginning. The other solution is to record in a loop that has an entry bar. I thought I would provide some tutorials on how to create some interesting vocals other than your typical delay and reverb. 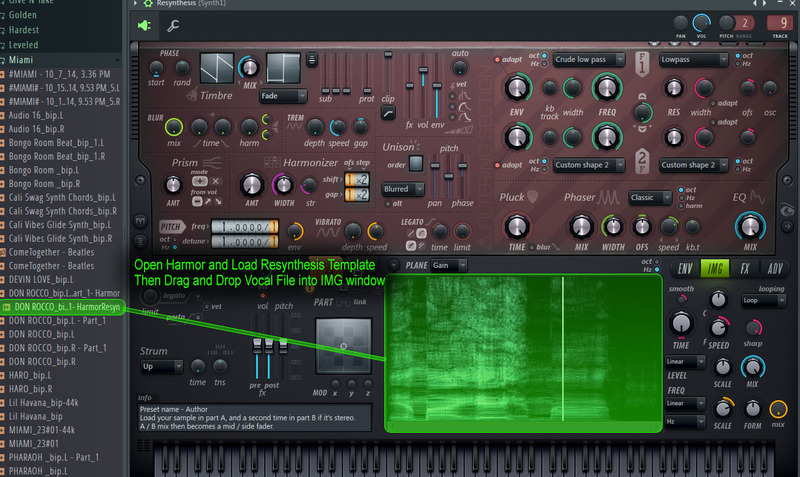 Harmor’s resynthesis engine allows you to do some pretty spectacular things with audio files, and one of the best is the ability to create chords out of vocals. 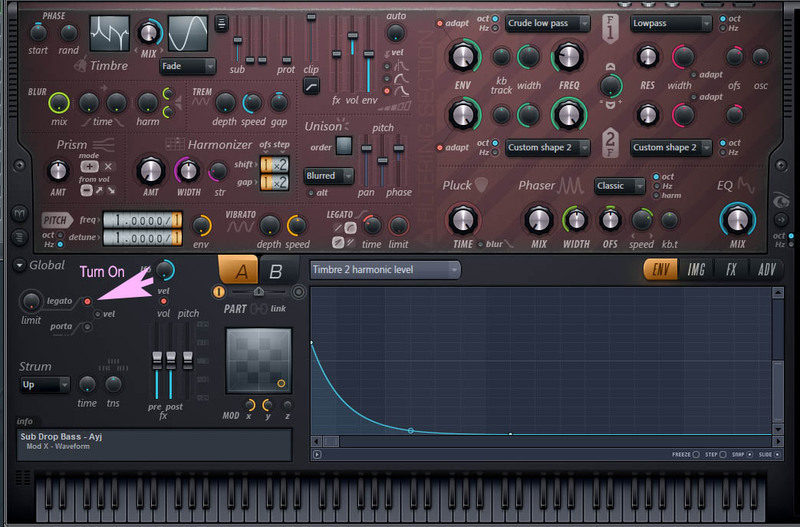 There are so many other modifications you can do with the audio files in Harmor as well, such as manipulating the time envelope to create stutters, holds, and reverses, even wobbly sounds. The first thing to do is to record or use a vocal track and find a C note if you want the keys to be properly mapped (you don’t have to do this, but for purpose of manipulating the sound and making a synth-like preset, it really is the way to go in my opinion). You can use some type of pitch correction/detection software like Newtone, Pitcher, Autotune or Melodyne to find or move a vocal to C (even if you only have the demo version of Newtone you should be able to export the vocal to a wav file from the playlist). Keep the modification of the natural pitch variance in the vocal to a minimum for a more natural sound. Not all vocals will migrate smoothly to a different pitch, so there is a bit of trial and error required to find a good sound to use. Once you have the recorded vocal, take a look at the recoding and trim the extra silent space and unwanted recordings at the beginning and end of the file. 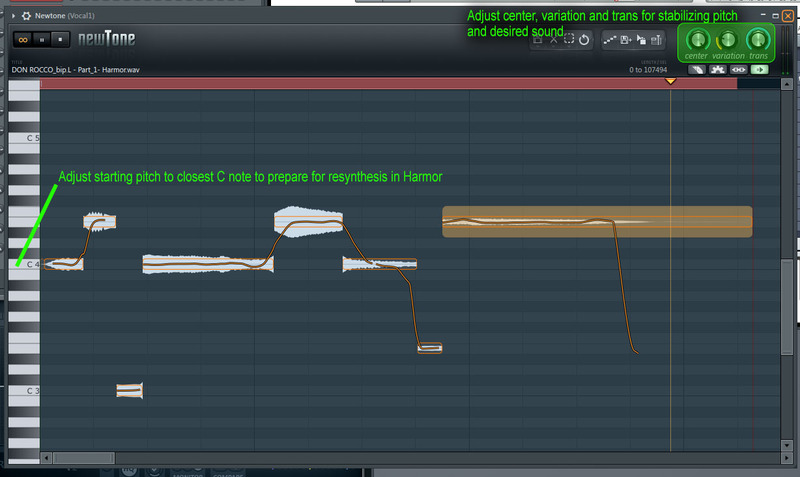 We’ll do this to have the vocal sound start at note activation of a note in Harmor. Save your file somewhere where you can drag it into Harmor. 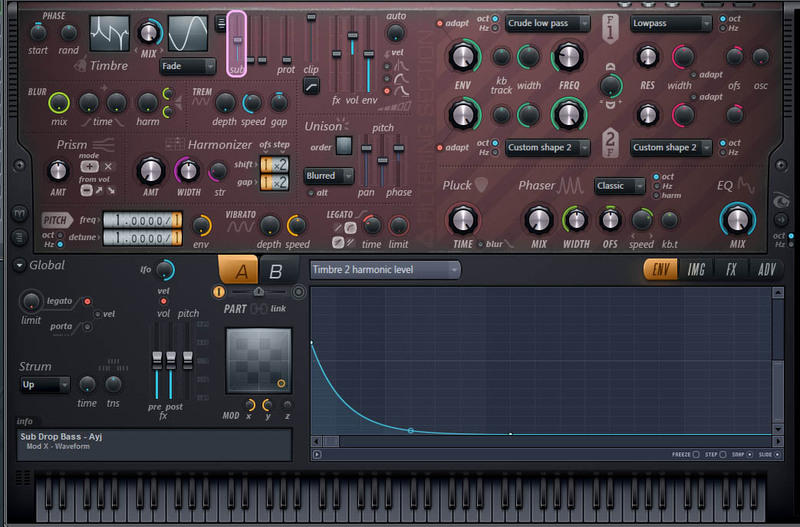 In Harmor choose the resynthesis preset. Then, in the Harmor GUI, click on the “IMG” tab, and drag your file into the window. You should see a visual representation of the audio file. You should now be able to activate the recording through Harmor by clicking on a key in the GUI with the mouse, or your MIDI controller. If you hold it you will see that it naturally loops if you hold it longer than the duration of the recording. 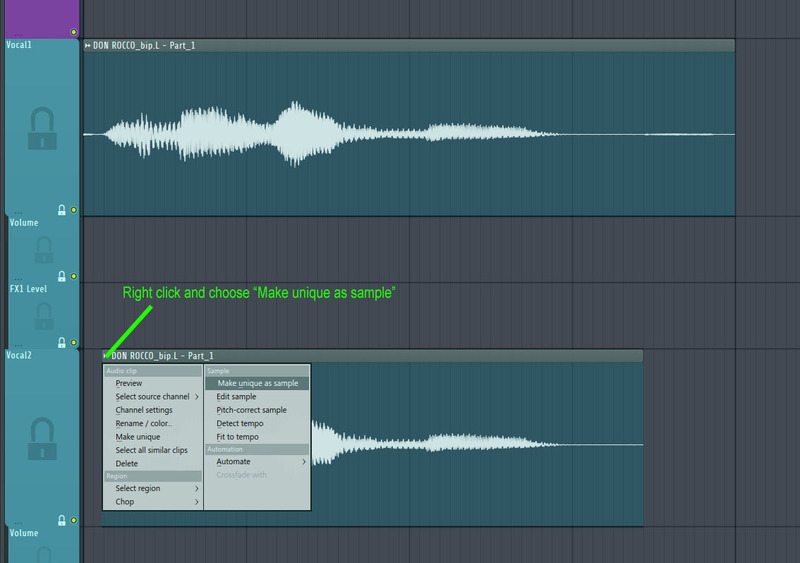 If we want it to hold a sound until release we will need to create a looping envelope that sounds natural. So what we will do is use the “Image Time Offset” envelope. If you want your envelope tempo synched click on the radio button next to “Tempo” on the lower left of the envelope interface. Next, you may want to move the end point of your envelope if you used the time synched option so that it is a certain length. Now create a node somewhere between the start and end of the envelope, and right click to get the menu option to define “Loop start”, then define the point of the “Sustain/loop end” from the endpoint which has likely moved to the same vertical position as the loop start. At this point the looped portion is more of a held harmonic position, but you can add a little variance by creating another node between the start and end of the loop, and raising or lowering the vertical position. This is a balance so you just want to play around with it until it sounds acceptable. Play a couple of chords to see how it sounds. Save the preset when you are happy with it. 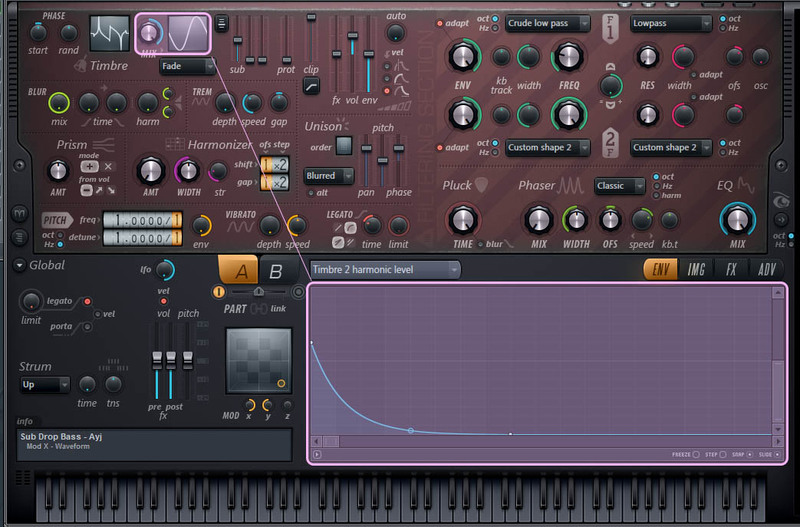 If you have something you are happy with in the previous example with the vocal chord preset. We can make a variation that won’t play chords but will allow your vocal to move from note to note while it is playing by just simply activating the “Legato” on the left side of the Harmor GUI. 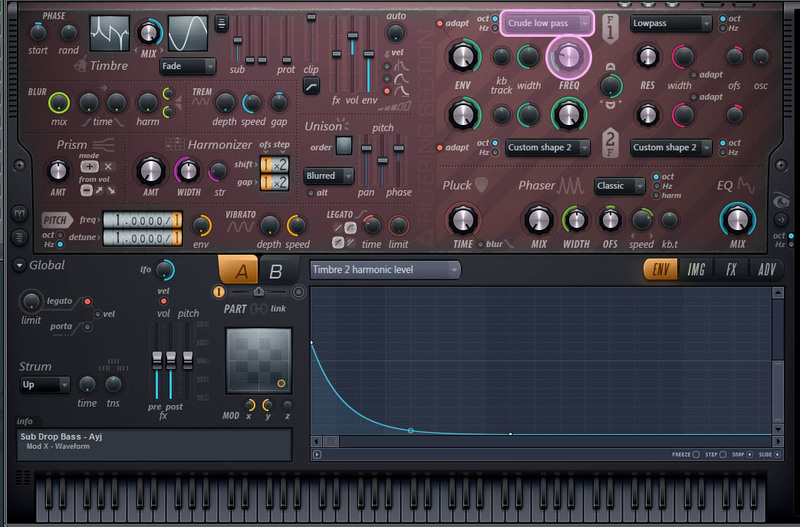 This creates a more artificial sounding vocal, but can make some interesting sounds. If you are happy with the results of this preset save it as a different preset. One method that a lot of recording studios and vocalists use is to layer multiple vocal recording takes on top of each other to create a natural unison sound, or even a natural chord-like sound. You can take this technique a little further for some great effects. One method is to pan one take hard left, another take hard right, and then keep one centered – you can then apply different effects to each with less overlap. Alternatively you can apply a strong effect to the center channel (e.g., heavy distortion) while applying subtle to no effects on the panned takes. The center channel bridges the vocals together, while the panned channels preserve some clarity. One of my favorite things to do with vocals is run them through an Guitar Amplifier type effect plug-in to create that dirty distorted and crunchy sound or to add some Wah Wah to a held note. Amplitube is a great plug-in to use to do that, but there are many others available. This is a simple tutorial on how to make a Descending Pitch Sub Bass (or Drop Bass). The inspiration comes from an old tool that many producers used back in the day called Stomper that was great for designing all kinds of sounds, but particularly good for kicks and subs. This tutorial provides what I believe to be an improvement on the Stomper tool and also demonstrates how to make creative use of the release portion of envelopes. In Harmor, we need to start with a Sine wave in the Timbre section, and make sure the mix is all the way over to the Sine wave. Next raise up the “Sub” to beef up the low end. In the Filter Section, select Crude Low Pass if it is not your default and go to about 10 O’clock – this will take off a lot of the high end sound. Right now you should have a pretty basic Sine wave sub. Now on to affecting the behavior of the synth on the press and release of notes. What we are going to do is create a sub bass that will descend in pitch on release of the note, but will keep a constant pitch while note ON information is sent into Harmor. Turn on the Legato so that the drop doesn’t occur if you slide into the next note. 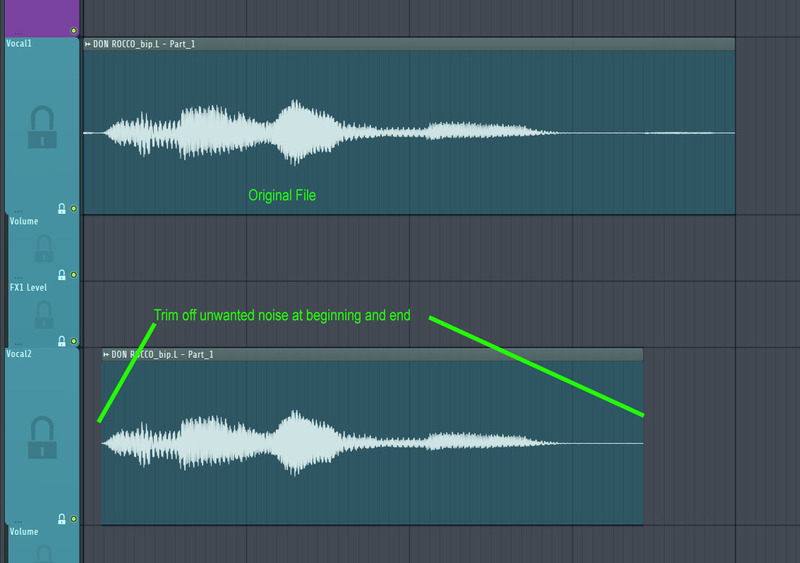 Now choose the Pitch Envelope to create the envelope for the drop on release (NOTE: this envelope was loaded from the menu option “Open State File” and selecting “Default ADSR” from the file browser). Activate the ADSR knobs and emulate the positions I have. This envelope will not make the drop on its own, because we need the volume envelope to activatedit (see the next instruction). The shape of the curve following the “S” will dictate the sound of the pitch drop and you can get creative with this. The Volume Envelope is the last necessary step to getting the pitch drop sound to actually work on release. Make sure to active the ADSR knobs and emulate the settings as I have them. Now test it and see how it sounds – it should give you the drop on release. I would suggest also putting an envelope on the Filter 1 to cancel out some of the clicking that may occur on the drop.